Hollenbeck Preserve Falls Village, CT.
Main Attractions: Nature Conservancy preserve, bird sanctuary, open fields, watershed, nice views. NOTE: Some report that at different times of the year the path is very hard to find causing some to wonder if the trail system is still official. Proceed at your own caution. Visit Nature Conservancy website to get updated info. 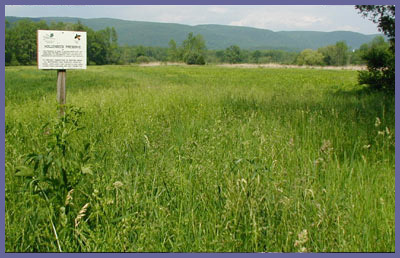 Hollenbeck Preserve located in Falls Village, CT is a bird sanctuary created by the Nature Conservancy that offers a nice open field walk through tall grass and thick brush. The preserve sits in a very scenic part of Connecticut surrounded by rolling hills and classic New England settings. Hollenbeck is an open field hike that eventually makes its way into the cover of woodlands. But this hike is primarily a hike through tall grasses of the open fields and through some soggy areas created by the waters flowing through the landscape. Birds flourish here as the cover of the tall grasses and water source allow them to nest and feed in relative peace from human influence. The hike at Hollenbeck is more a peaceful trek through flat open field than a power hike up and down hills. In the summer, wildflowers are in abundance with birds and insects flourishing with the benefits of the seemingly endless food source. If you hike at dusk or dawn, it's likely you'll see deer, turkey, and quite possibly fox or coyote. At face value the preserve looks like an old farm that has just overgrown with tall grass and various plant life. But if you look closely and really checkout the micro-environment in and beneath the tall grasses, you'll see an extremely active community of birds and insects. Hollenbeck offers year round hiking and the difference between cold weather and summer is quite apparent here. In the summer, you'll walk right through tall grass and other plant life up to your hips. In winter, it's stark here with all signs of life nearly gone. Both seasons offer unique experiences but obviously summer will provide a more spectacular viewing experience. One thing to be aware of in the summertime...it's tick season! And Hollenbeck is prime area for ticks since deer feed here at night or when they feel it's safe to venture out. As the deer make their way through the fields, the ticks latch on and off by hanging onto the tall grasses that you will be walking through. With ticks, comes the possibility of Lyme Disease. Lyme Disease seems to have really become more and more prominent in recent years so taking precautions is a must. A few things to remember about the possibility of Lyme Disease. Not all ticks carry the disease and if you just follow some simple steps you'll really decrease the chances of getting a tick. Wearing long pants tucked into your socks (looking stupid doesn't mean you are stupid!) will prevent anything from getting under your pant leg. Tuck your shirt into your pants and nothing gets under your shirt. Wearing long sleeves gives you another level of protection against the little critters. If your pants and shirt are bright colors, checking yourself (or if you're with someone else you can briefly look each over to make sure you don't have any "hangers-ons") will be easier since the dark colored ticks will stand out. If for some reason you find a tick later on, remove it with thin tweezers at the very base of the tick (right where it's digging in). Remove it slowly as you don't any remnants left behind under your skin. Removing a tick within hours of when you've been bitten will also drastically reduce the chance of getting the disease has it takes time for the tick to infect your body. Directions: From the intersection of Route 112 and Route 7 in Falls Village, go 2.5 miles north on Route 7. On your left will be Page Road. Just a few hundred yards up this road (maybe a tenth of a mile) is a small sign at an open field. 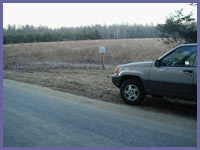 This is Hollenbeck Preserve and you just pull your car off of Page Road and park on the grass. Click "Get directions to this location" tab.